Harley and I recently have rebuilt our entire Rube Goldberg! We got it to where we were before hunter destroyed it but we are making it longer. Instead of the golf ball hitting and knocking over the tower we realized that the golf ball doesn’t have enough force and power to knock over the tower so we set up a few dominoes instead of the tower. We are brainstorming ideas on what we can do with the dominoes. I thought garage band was cool because I desovered all these new and cool hidden tricks and features. An example of that is I messed around with the settings on the piano and it made this weird but cool sound. I liked studying dvorak. And I also like listening to his jaws piece. I thought it was really cool when all the instruments clashed it sounded like an argument. On Friday Rushes dad (Mat Schwartz) came in and talked to us about the Supreme Court. He was a clerk for Supreme Court Justice Samuel A. Alto. Right now Mat is a lawyer. He didn’t really talk to us about being a lawyer but his experience as a clerk working Supreme Court for a justice. He had talked to us about some of the cases that he had experienced while clerking. We also took this little quiz on the ares that he covered. I really thought it was interesting how the Supreme Court works. He also told us on how we had nine justices but recently one died so we only have eight justices and they can tie on a case and the ruling from the court below will be the decident. I really enjoyed rushes dad coming in on Friday. What I really thought was cool was that there was a Supreme Court case in Scarsdale. It was about churches putting up giant Cheshire in the middle of the town. The town told the churches to take it down because it symoblized that the town was christian but there are so many jews in Scarsdale. The church refused to take it down so the case went all the way up to the Supreme Court. Eventually the church won the case. In conclusion I really liked having Rushes dad come in on Friday. Yesterday for our second expert lecture Olivia’s mom came in today to talk about “the joy of giving”. I found out some interesting stuff like multiple ways to donate and give back. One of the more interesting things I found out is that Olivia’s mom is from china and has written two books about. I thought that the presentation on giving was interesting. Some of the forms of giving are donating clothes, food and money. There are to ways to give indirect and direct. indirect is like mailing someone a gift you don’t go up to them and give it to them you would have the gift go thought a series of events. direct is like giving a homeless person money on the street that would be direct you walk up to them and give it to them. I really enjoyed Olivia’s mom coming in. It was mid noon. The stakes were high. It was me and my cousin Issac against my brother and my two other cousins. We had the unfinished basement and they had the playroom. We were going to attack like this , There was a hallway between us and two doors to the playroom. I would sneak in through the bathroom entrance and Issac would stand out side the main entrance hidden behind the wall when I yelled go we would storm the base and attack it was all so simple we put the plan into action. But that’s where it all went wrong. Today after anticipating and guessing who would come in for our first expert share we finally found out. It was Rania’s dad. Today he came in and talked to us about money. From the stone ages of money (bartering) to today’s version of money. He also told us about bit coins. Bit coins are a new and modern version of money. They are a digital version of money. However though bit coins are still a work in progress and are not fully released. I think they will be a cool and new way off money. We also talked about counter fitting and how with the help of bit coins if everything goes well they should help reduce counter fitting. In conclusion I thought it was very interesting. Our second launch has come to a conclusion. It was very exciting and I think my group did the best. 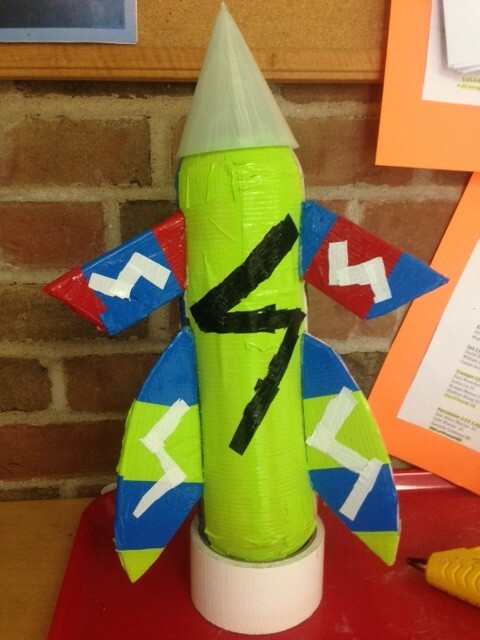 I was very tense to see will our rocket go high or will it go low like our first launch. I was anticipating that the rocket would go high and luckily I was right. For our first launch our clinomiter average from clinomters 1a and 1b were 10 degrees. our clinomter average from 2a and 2b were 26.2 degrees. For our second and more recent launch how ever though our clinomiter reading were a little more accurate and a little less far fetched. For clinomiters 1a and 1b our average was 26 degrees and for clinomiters 2a and 2b our average was 33.85 degrees. Therefore I state that on our second iteration I believe that we did a much better job than our first iteration.